We’ve got our annual bike ride coming up and we seriously have not had much time to get out on the roads and have much saddle time on the seats. I’m not so worried about us being able to do the ride, but you have to ‘condition’ your body to sit on those tiny little seats for many hours a day and then for 7 days! So of course we had about 10 million things to do this morning, anything from going to meetings and setting up displays to hauling hay into the sheds and doing chores. But once that was all done and we got some food in our bellies – well there was no more excuses that we could think of so we loaded up the bikes and went to a local town to get started. We had a great time just hanging out together even though it was pretty hot out! 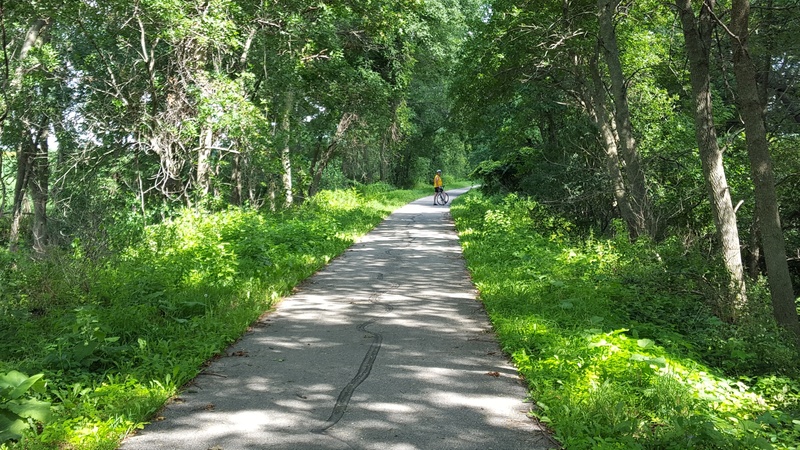 We started the ride in Fort Atkinson and took the back roads to the nearby town of Spillville. I just had to take picture of their town’s square because it seemed like something out of a Norman Rockwell picture. The town was quiet with the exception of a couple of ladies who were out working in their flower gardens. 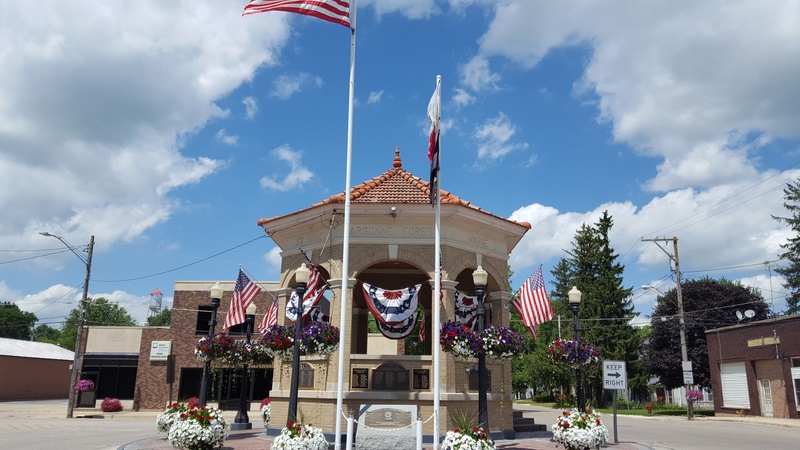 And the gazebo in the middle of town was decorated beautifully with flags and flowers. How cool is that? I think it just waits quietly until someone like us comes by to check out. We then headed north to the next town to get some fast fried food that probably isn’t the best training food for us, and then to also refill our water bottles. We weaved around town and soon found ourselves on the bike trail that connects all these towns together. It’s a very cool trail and even literally when it’s hot out it’s a ‘cool’ trail. The trees seem to block a lot of the sun’s mean rays during the hot days. Now normally we don’t ride on trails that often, but it seemed like a good idea today. Then we hopped back on the county road and headed to the town that we started the day in. I didn’t realize just how hot it was until we stopped. Yikes! So once we got home I got out the ice from the fridge and filled up the bird bath in front of our house for the dogs. 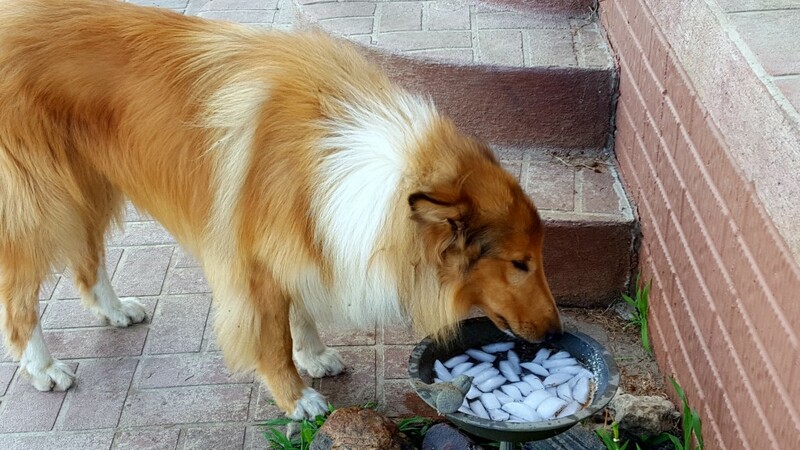 See our dogs normally like to drink water from the bird baths for some reason and when it’s got ice in it – well it just kicks it up a notch! This entry was posted in Our dogs, Riding bikes. Bookmark the permalink.